Razer Star Wars: The Old Republic Gaming Mouse for $139.99 with free Super Saver shipping. Tensions between the Sith Empire and Galactic Republic have erupted into an explosive battle of epic proportions. War is coming and whichever side you choose, only those armed with the Star Wars: The Old Republic Gaming Mouse by Razer. will emerge victorious. Cut down enemies in swathes, and execute battle plans faster when the mouse equips you with an astonishing 17 buttons to put more abilities at your fingertips. 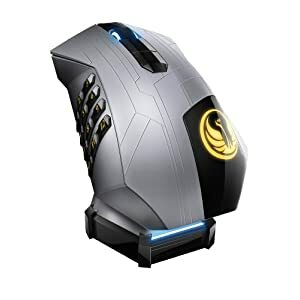 The Star Wars: The Old Republic Gaming Mouse by Razer is also built with cutting-edge gaming grade dual wired/wireless technology to allow greater freedom of maneuverability when unwired without compromise on control or accuracy within the game. When the battery needs charging, switch the mouse to wired mode and jump back into the fray with zero downtime. As the impending bloodshed between the two factions looms ever closer, the mouse comes with two gold-backlit interchangeable emblems featuring the iconic symbols of the Sith Empire and Galactic Republic to decide which faction you'll swear allegiance to. With the Star Wars: The Old Republic Gaming Mouse by Razer, you're the ultimate force to be reckoned with.